A set of Jennings brand J/ship 332 platform weighing scales. For heavy dury warehouse / industrial use. These scales are ideal for weighing items in your warehouse or office, and can handle up to a mammoth 150kg!! With precision accuracy, the scales still measure to the nearest 0.1kg. The platform is made from stainless steel, making it more durable and heavy duty than most. Its platform is considerably larger than most other scales, hence is perfect for items of all different shapes and sizes. 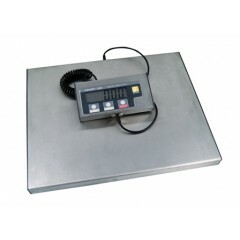 Although designed for heavy industrial use, the scale is lightweight and extremely easy to carry or move. It can also be mounted for security. Can plug into a socket (free AC adaptor included) or be used with 4 x AA size batteries (not included). Up To 332lb - in increments of 0.2lb"
Usability - Warehouse, Office Parcels, Shipping/Receiving etc. Platform Dimensions - 15" x 12" x 1"